The Conway Center’s eighth annual Family Business Forecast has found that two-thirds (66.2%) of family businesses surveyed plan to increase hiring in 2019, similar to last year. The Conway Center fields the annual forecast to gauge the economic climate – including employment and related challenges – among family businesses in the region. Finding qualified workers remains the top concern among family business leaders (46.2%), while concerns about competition are increasing, both from traditional and online sources. Family business leaders remain optimistic about Central Ohio’s business climate with half 50.0% feeling “very good” (the highest rating). This is down slightly from last year (57.5%) but still significantly ahead of 2017 (32%). Sales forecasts and volume continue to drive the positive economic outlook and decisions to increase employment. Nearly three-fourths (74.4%) said sales forecasts/volume will be the biggest factor that will impact their decisions to increase or decrease employment, with compensation (39.5%) also being a major factor in hiring decisions. Family business leaders were asked how recent national and local issues will affect them. 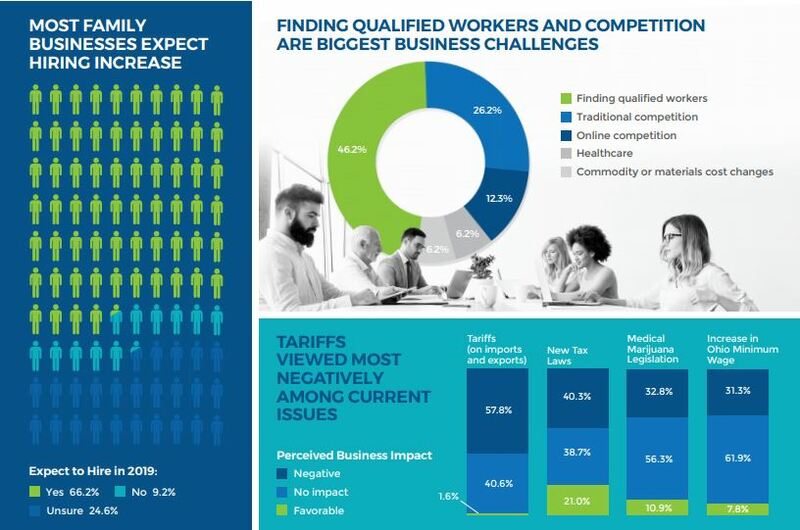 Nearly half (47.8%) viewed new tariffs on imports and exports has having a significant or somewhat negative impact, while 40.63% thought they would no impact. New tax laws are more positively by family businesses. Only 4 in 10 (40.3%) of respondents felt new tax policies beginning in 2019 would negatively impact their business. Two in ten (20.97%) felt the new laws would have a positive impact, while 38.7% say they will have no effect. Slightly more than 6 in 10 (60.9%) family business leaders feel the Ohio minimum wage increase would not impact their business, while 30.3% felt it would have a negative impact. Only 6.3% felt it would be beneficial. On a social issue, medical marijuana legislation, more than half (56.3%) of respondents felt the new legislation would not impact their business, while 1 in 3 (32.8%) felt it would negatively affect them in some way. Competition remained (20.9%) the third largest factor for hiring decisions, while “healthcare costs” reached a three-year low at (14.0%). Industry competition is an overall concern for family business leaders. Nearly four in ten (38.5%) said that competition is the most significant challenge to their business in 2019. Traditional competition accounted for 26.2% of these responses, while 12.3% of responders specifically cited online competitors. This was the first year online competitors were included in the survey. Asked about their top hiring challenges, more than half (56.9%) of the survey respondents cited finding qualified workers. Finding employees that fit with the company culture (24.6%) is another major challenge.